Trinidad will be the main exception to the temperature drop, with highs both Friday and Saturday reaching the mid-60s. Elsewhere, low to mid-60s are expected across the plains Friday before Saturday's temperatures drop off to freezing or below as a cold front spreads across the region. Friday will also bring strong, gusty winds to the northern mountains. Sustained west winds in the 25 to 40 mile per hour range are expected, and some higher elevations will see gusts to 90 mph. Blowing snow will reduce visibility in the mountains. Much weaker wind is forecast across the northeast plains. Strong wind is also expected in the southern mountains. 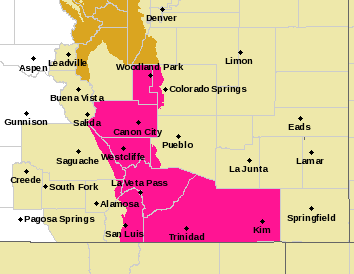 Combined with warm temperatures, a red flag warning is in effect for all or portions of El Paso, Teller, Fremont, Saguache, Custer, Huerfano, Costilla and Las Animas counties. 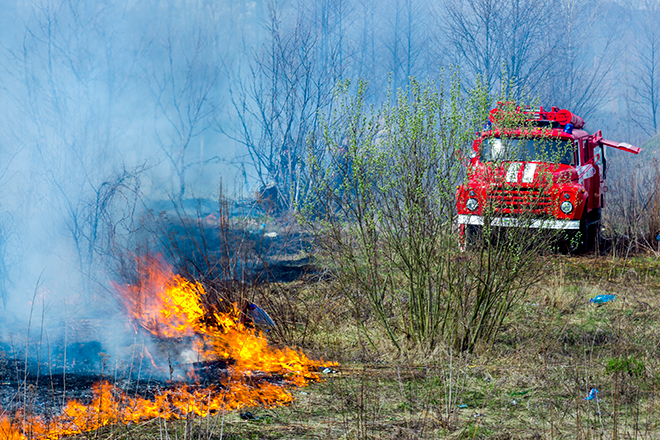 Low humidity and dry fuels are contributing to the fire risk, so avoid all activities that could spark a fire. The warning goes into effect at 10:00 a.m., and will continue until 5:00 p.m.
With high pressure over the area, look for less-active weather conditions for western Colorado. Temperatures will be above normal for this time of year. Expect upper 40s to low 50s Friday, increasing a few degrees Saturday before dropping back to mainly 40s Sunday as a cold front rolls in. The front will have little moisture available, so earlier predictions of isolated showers have been scaled back. Overnight lows will still be on the cool side as temperatures drop to the teens and low 20s. New Year's Day will generally continue the weekend trend of above-average highs.